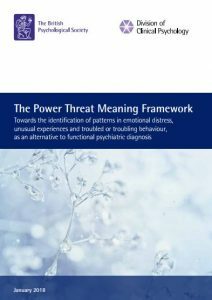 The framework described here, the Power Threat Meaning Framework, is an over-arching structure for identifying patterns in emotional distress, unusual experiences and troubling behaviour, as an alternative to psychiatric diagnosis and classification. The document sets out the conceptual and empirical basis of such a system and is intended as a foundational intellectual resource. It is important to note that the framework is not tied to a particular level of explanation (social, psychological or biological) or to a specific theoretical orientation such as cognitive, behavioural or systemic. Thus while we suggest it can be used as it stands, it can also be seen as a meta-framework within which many existing models and bodies of evidence can be accommodated, and which can be used to inform future projects translating the framework into practice.